Ecosavr? is an effective liquid solar pool cover product that greatly reduces heat loss and evaporation from your exposed pool surface. Ecosavr? will save energy in EVERY heated pool, but heat cost savings vary according to the hours of swimmer use per day, pool design and equipment and especially the type and cost of fuel used. Ecosavr? is a small disposable plastic fish containing Heatsavr? liquid. The product is dispensed through a patented valve in the fin, and forms a transparent, one molecule thick layer on your pool. The liquid is biodegradable, odorless, safe, and undetectable by users. Ecosavr? 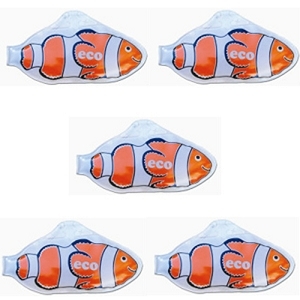 is recommended for use on residential pools: One Ecosavr? will cover a 400 sq. ft. pool, which is about 15,000 gallons of water, for approximately 25 - 30 days. Two Ecosavr? are required for larger pools If more than two Ecosavr? are required, it is recommended that the pool owner or operator considers using Heatsavr?.